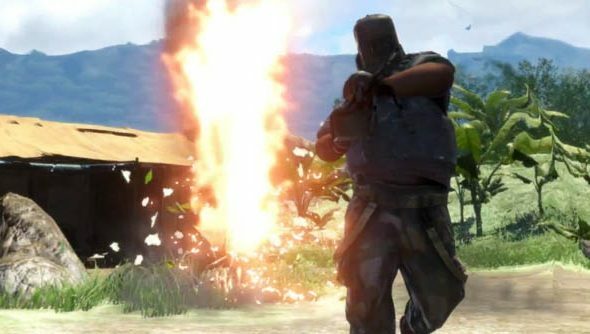 There’s many a good word out there on the big wide internet for Far Cry 3, heralding it as game of the year material for its masterfully constructed open-world and great shooty bang-bang. Though, as the latest trailer displays, you don’t have to play it on your own. You and three others can op onto the island play through a co-op campaign, doing violence together and shouting rude words. As the trailer shows off you’ll be able to drop into the boots of either Callum,the Scottish thug; Leonard, the corrupt cop (presumably from the United States of Generica); Tisha, the ex-soldier (again location assumed); and, Mikhail, the Russian hitman. They’ve their own tale to weave through the island. I say weave, though that suggests quite a subtle, deliberate activity, I think aggressibely fumble may be more appropriate. If Tim’s opinion of Far Cry 3 is anything to go by then a four-player co-op campaign could be an excellent way to while away an evening ofHawaiin pizzas and a bottle of rum.